• The tree houses remain in high demand even during the dead of winter, when snow covers the ground. Troop 501 will be camping in the Tree Houses February 27-March 1, 2015. This will be a unique experience that our Scouts will not want to miss! This week, the Scouts will be developing their menus, shopping lists, and duty rosters for the weekend. Be sure to come, so that your voice will be heard! On Presidents Day, let’s remember Gerald R. Ford, our 38th president and, at least so far, the only Eagle Scout to ascend to the most powerful post in the country. Ford, who earned the Eagle Scout award in 1927 as a member of Troop 15 in Grand Rapids, Mich., went on to receive the Distinguished Eagle Scout Award in 1970. It has recently been said that I am too much of a Boy Scout in the way I have conducted myself as President, and so I reviewed the Boy Scout laws and Boy Scout oath. They say that a Scout is trustworthy, loyal, helpful, friendly, courteous, kind, obedient, cheerful, thrifty, brave, clean, and reverent. That is not bad for somebody who knew it 46 years ago. Well, if these are not the goals of the people of the United States, what they want their President to live up to, then I must draw this conclusion: Either you have the wrong man or I have the wrong country, and I don’t believe either is so. When Ford died in December 2006, his family requested an honor guard of 200 Eagle Scouts. They knew how important Scouting was to the man throughout his life. In fact, 400 Eagle Scouts — age 15 to 85 — showed up to line the road to his presidential museum in Grand Rapids. President Ford’s legacy continues with the USS Gerald R. Ford, a $13.5 billion, 1,106-foot aircraft carrier set to join the U.S. Navy’s fleet in 2016. Last month, the ship’s crew released the Gerald Ford‘s official crest. It features 38 stars, representing Ford’s tenure as our 38th president. The colors include blue and maize, honoring his undergraduate alma mater, the University of Michigan. But it’s the fluer-de-lis at the top of the compass that really caught my eye. The fleur-de-lis, of course, shows off Ford’s achievements as a Boy Scout, and its northern position on the compass says a lot about how much Ford’s life direction was positively shaped by his time in Scouting. Beginning in 1924, Scouting played an important role in Ford’s life. At the age of 12, he joined Troop 15, sponsored by the Trinity United Methodist Church in Grand Rapids, Michigan. He earned his Eagle Scout badge with Bronze and Gold Palms in 1928. He also participated in the Eagle Scout Governor’s Honor Guard on Mackinac Island. In 1970, Ford received the Distinguished Eagle Scout Award from the Grand Valley Council (now known as the President Gerald R. Ford Council), and later he received the Silver Buffalo Award. After World War II, Ford returned to Grand Rapids and became involved in civic affairs. Ford married Elizabeth (Betty) Bloomer Warren on Oct. 15, 1948. They had four children together—Michael Gerald, John (Jack) Gardner, Steven Meigs, and Susan Elizabeth. In 1948, he was elected as U.S. Representative for the fifth congressional district, and he continued to serve for 13 terms. After he was elected to his ninth term as congressman on Jan. 4, 1965, Ford became the House minority leader. That selection set the stage for his appointment to the vice presidency. 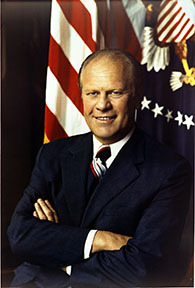 After Vice President Agnew resigned in 1973, President Nixon chose Ford as his vice president, making Ford the first to be appointed according to provisions of the 25th Amendment of the Constitution. On Aug. 9, 1974, Ford became the 38th U.S. president after Nixon resigned. As president, Ford guided America through a difficult period when both Vice President Spiro Agnew and President Richard Nixon left their offices. Undoubtedly relying on his experience as an Eagle Scout and the Scout Oath and Scout Law, Ford brought service and integrity back to the White House. His full pardon of Nixon, though unpopular, was an attempt to unify the polarized, partisan country and set the nation back on the road to recovery. President Ford passed away on Dec. 26, 2006, in California. Hundreds of Scouts participated in his funeral, and a few Scouts were selected to serve as ushers at the Washington National Cathedral.